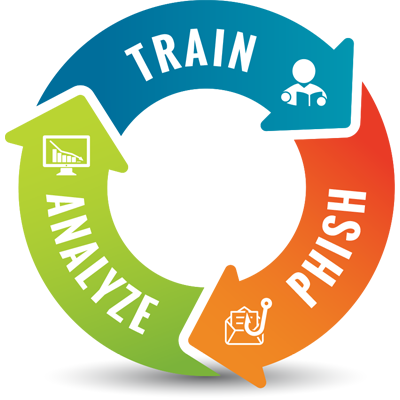 KnowBe4 is the world’s most popular integrated Security Awareness Training and Simulated Phishing platform. More than 24,000 organizations worldwide are using it. You now have a way to better manage the urgent IT security problems of social engineering, spear phishing and ransomware attacks. Our SaaS subscription is priced per seat, per year. We offer Silver, Gold, Platinum or Diamond levels to meet your organization’s needs, comprised of three levels of training access and increasingly powerful features. Pricing in US$ as per Jan 2019 for North America. List pricing may be modified at any time, and may be different in different countries. Ask for our non-profit and competitive upgrade discounts. KnowBe4 offers attractive discounts for a 3-year contract. Get started today by filling out the form on the right. Find out how surprisingly affordable this is. X Year-round unlimited simulated phishing attacks with use of all phishing templates. X A tool that allows you to build a customized Security Awareness Program that will help you create a fully mature training program in just a few minutes! X Library of security awareness emails to send to employees as part of ongoing education for compliance. 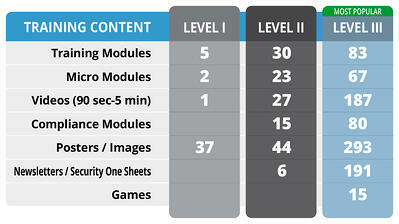 X Training Access Level I: Access to three Kevin Mitnick Security Awareness Training modules in 45, 25, and 15-minute segments and over 35 security awareness posters. X Allows you to fully automate rollout of your training, including scheduled automated reminder emails for all users. X A one-click email client add-in button that gives your users a safe way to report email threats. When the user reports a simulated phishing test the user’s correct action is reported in the console. When the user reports a non-simulated phishing email, the email is forwarded directly to your Incident Response team. X Allows you to track users that reply to a simulated phishing email and capture the information sent in the reply mimicking how Business Email Compromise attacks work. X Easily upload user data by automatically synchronizing your AD user information with KnowBe4’s platform. X Compare your organization's Phish-prone percentage™ with other companies in your industry. Monitor employee percentages over time and watch how performance from your initial baseline phishing test, after 90 days, and 1 year compares. X New and innovative functionality that helps you identify risk at the user, group and organizational level and enables you to make data-driven decisions when it comes to your security awareness plan. X With 60+ built-in reports, you have visibility into your entire organization’s security awareness performance with insights into correlated training and phishing simulation data over any specified period of time. X We will pay your ransom* if you get hit with ransomware due to human error of an employee while you are a customer. *Terms and Conditions apply. 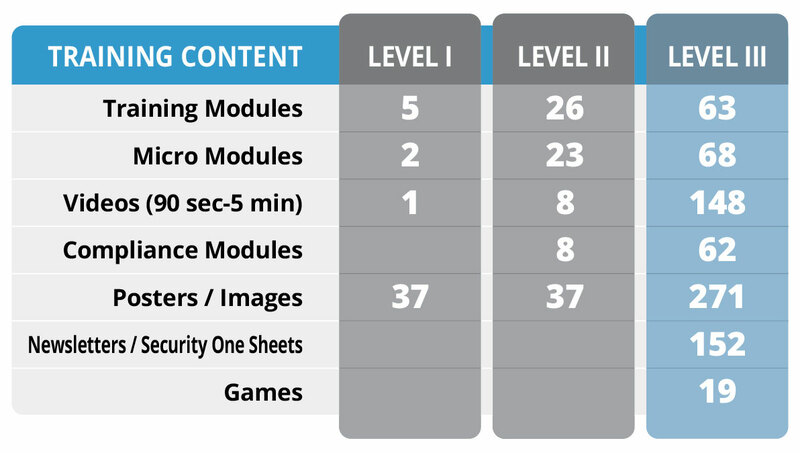 X Training Access Level II: Includes Training Access Level I and 70+ KnowBe4 training modules that includes 5-minute micro modules on compliance and security for staff and executives. X Deep web search crawling business social media information and hundreds of breach databases to return any data that resembles an email address at your organization and identifies your at-risk users. X Voice phishing feature that calls users to try and coerce them to enter information over the phone. X Create dynamic groups of users with specific criteria such as department, user behavior, or location to conduct tiered phishing campaigns, automate workflows and stratify users into groups based on risk level. X Enables you to customize and obtain reports by integrating with other business systems that present data from your KnowBe4 Console. With the REST API, build custom dashboards using phishing, user, and group data. X Allows you to assign granular and delegated access control for groups of users within the KnowBe4 console. Create custom permissions for the exact roles needed by your organization. Easily allow groups like HR teams to access reporting only to review individual user results or employees with limited admin privileges to create phishing and training campaigns across different geographic locations. X These indicators turn every simulated phishing email into a tool IT can use to dynamically train employees. It's an instant report card showing the red flags users missed within the phishing email to help reinforce learning and new user behavior. X Allows you to test your users' reactions to unknown USBs found in and near workspace. X Your support tickets are routed to the top of the queue for Platinum and Diamond level customers. X Training Access Level III: Includes Training Access Levels I & II plus over 800 different training content including games, videos, posters, and newsletters. X Uses artificial intelligence to inoculate your users against various attack vectors of social engineering. AIDA quickly and easily allows you to simulate a multi-faceted social engineering attack, using phishing, smishing, and vishing--any of which could compromise your network. X PhishER is a simple and easy-to-use web-based platform that helps your InfoSec and Security Operations team cut through the inbox noise and respond to the most dangerous threats more quickly.